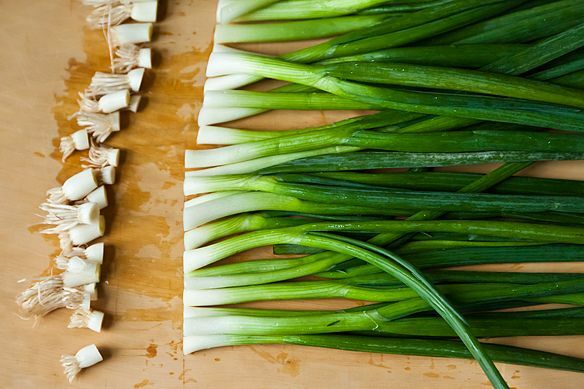 Today: Scallions graduate from garnish to side. We hear braise and we think pot roasts, ragus, and other long-burbled pots of meat that fall to pieces. And, like Pavlov's dogs, we get deeply excited. But too often, we bookmark the idea of braising for some faraway weekend or the day we might finally break down and buy a crock pot. 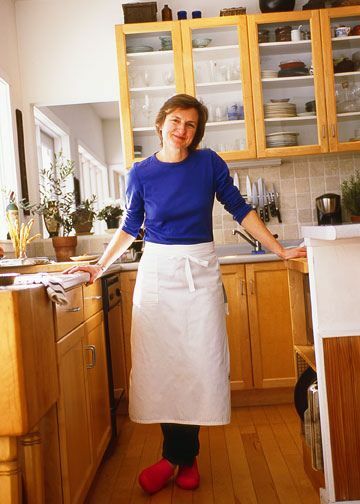 But that all changes with Molly Stevens' book All About Braising, where she begins the conversation not with the typical well-worked cuts of meat or tough old birds, but with vegetables, then fish. Chicken fricassee and coq au vin don't even start to show up till chapter 4; beef debuts on page 214. The book rightly won both James Beard and IACP awards in 2005. It is with these earlier chapters that braising is opened up to us even on the weariest weeknight. Short-braising, as Stevens calls it, gives us the same benefits as the longer version -- the ease, the single pot, the self-basting and concentrated flavor --- with much less advance notice required. The Vegetables chapter is particularly inspiring, as Stevens braises endive with pancetta, leeks with cream, fennel with thyme and black olives -- and whole scallions with water, and very little else. Scallions are usually just a pretty face. Sliced into dainty coins, they doll up a homely bowl of chili and float like lily pads in murky dipping sauces. But treat them right and they're proud and delicious, all by themselves. Here's how: Lop off the roots and tops, pile them in a buttered baking dish, and scatter on a bit more butter and either tarragon or parsley, depending on your mood and your herb supply (not to be confused with your Air Supply). Pour in just enough water to get them steaming, then stick them in the oven to brew, tightly covered. Half an hour later, an oniony-rich perfume will be wafting about and your scallions will have mellowed and collapsed. Crank the heat to boil down the glaze and roast the tips. The final, non-negotiable step is squeezing on some lemon. What remains is sweet, soft middles, blurred herb-smoked edges, and sparks of lemon, which you can twirl around your fork like linguine. Or, I'm guessing, you could cut them up like a proper vegetable side, especially if you're already slashing through your ribeye or lamb chop with a sharp steak knife. But I wouldn't know, because every time I've made them, whoever is nearby simply crowds around, plucking whole scallions from the pan and stuffing them into their mouths. They're not the most delicate finger food, but neither are buffalo wings. Lemony juices and roasted bits of tarragon cling to your fingers and the pan is quickly emptied. 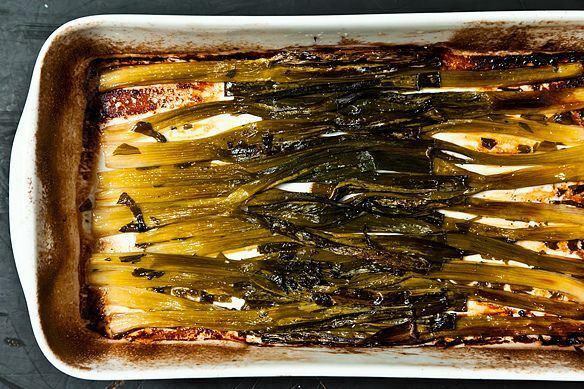 So you may want to plan on a backup vegetable side. Preferably something braised. Note: Molly Wizenberg is also a big fan of Stevens' braised vegetables. Hear an early Spilled Milk podcast on braising and this recipe here (then subscribe the podcast quick, if you haven't already). Per her co-host Matthew Amster-Burton, "We're in for a meal of garnish." I've got this in the oven right now and it smells amazing. I can't wait for spring to try it with ramps! After braising leeks for years and making scallion oil for vietnamese dishes I can't believe this never occurred to me. Another great low carb intense flavor side dish. Though, of course my brain says you could also puree and spread on toast or toss with pasta. Those would be fantastic on a pizza. That is an awesome idea! I am definitely going to try it. Love the idea of braised scallions as finger food. Yum. For maximum enjoyment, trim away only the hairy root ends and the thinnest sliver of the bulb. 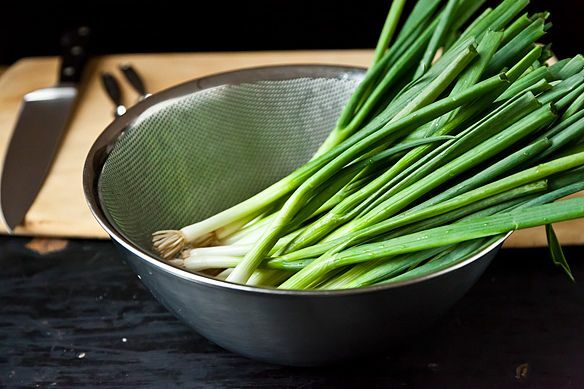 The bottom bulbs are the sweetest, juiciest part of a scallion, so leave them intact as much as possible. I recently made this with fresh dill in place of tarragon, so good. Try any leftovers (if there are such a thing) with eggs. So good. Thanks for this wonderful recipe, Molly! Yes, by all means, trim as little of the bulb as possible -- to get this shot, I was balancing on my knees, squeezed between an old salvaged chemistry lab table and a dresser in Amanda's bedroom (a.k.a. our photo studio), so I didn't do the best job of that. I'm sure all of you will do better! Scallions don't get enough credit. Now I won't feel bad buying a bunch of scallions just to use one in a recipe! I am longing to own Molly Stevens' books; everything I've read about them has been so inspiring. I totally want to make this but am sad to see she has you lop off those beautiful roots. At Smorgasburg last summer, a vendor called Saucy by Nature served grilled scallions as a side order to their falafel sandwiches, and THE BEST PART, to my surprise, was the scallion roots! If they are good grilled, I bet they are also good braised. You just have to rinse out all the dirt and they are downright delightful--full of sweet, crunchy, earthy flavor. The most exciting part of the vegetable if you ask me. Had no scallions. I used the last-of-the-season leeks, a bunch of spindly pencil-thick castoffs from a box in the cold woodshed. I sliced them in half, length-wise, and gave them the braising treatment. Never has something so delicious come from something so scraggly. Alas, no more leeks. Time to start some more under the grow-lights. 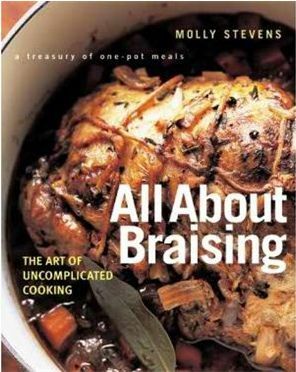 All About Braising is one of my all-time favorite cookbooks, but I've never made this dish. You've inspired me to try it! 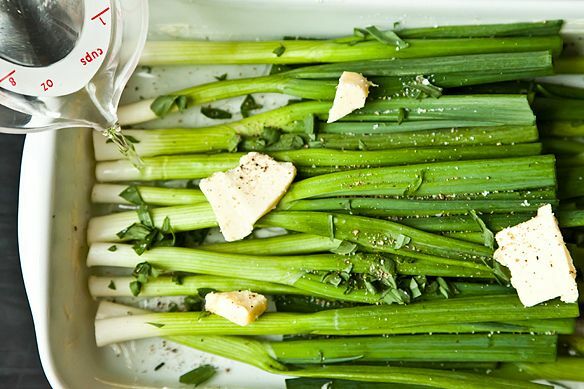 The pictures above are amazing, by the way -- never have scallions looked so good. In Canada (at least in my neck of the woods), these are called Spring Onions. Are they same? Yay!! I thought we, Indians were the only ones that referred to these as spring onions! !